Technological advances can lead to the emergence of new types of diseases. We tend to think of this as a modern phenomenon, but recent studies of bodies excavated from graves in the Middle East reveal that humans have inadvertently been a cause of their own illnesses for thousands of years. Recent examples of technology-related illnesses include the Nipah virus: the result of massive deforestation in Malaysia, which prompted disease-carrying fruit bats to stray into human-populated areas. Or, Legionnaire's disease, which was largely dormant until the late 20th century, when methods for regulating water temperatures such as cooling towers allowed the bacteria to thrive. Now, recent research published in The Lancet journal suggest that disease, caused by irrigation, struck populations of early humans. A team of archaeologists and biologists investigated the parasites present in 26 prehistoric burials of people living at the site of Tell Zeidan, an early farming settlement located on the confluence of the Balikh and Euphrates rivers in northern Syria, which dates from between 7,800 to 6,000 years ago. 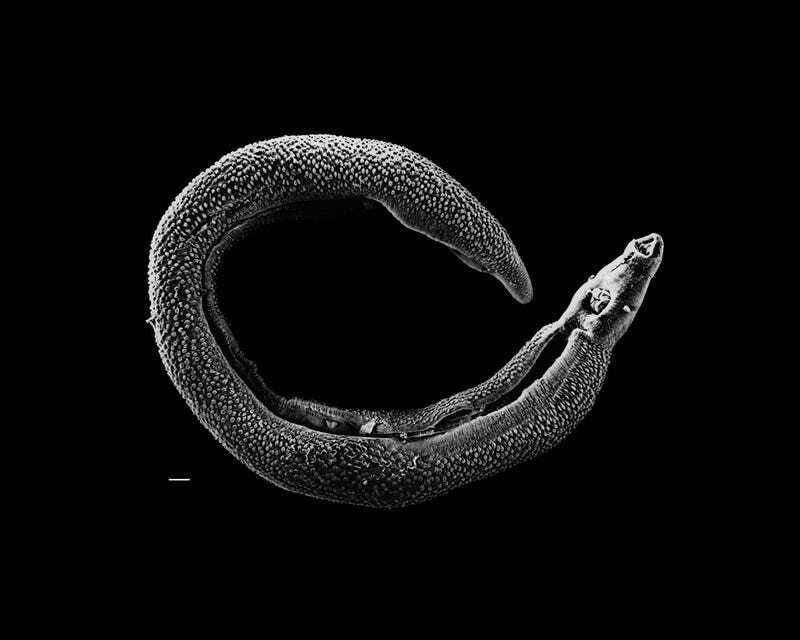 In one individual, they found the egg of a terminal spined schistosome, which is a flatworm parasite [photo above] that causes schistosomiasis, also called bilharzia. The disease is spread by people wading or swimming in warm, slow-moving, fresh water. These sources of water are colonized by water snails that can then act as an intermediate host for the parasite. When people are in the water, the parasites leave the snails and burrow through the human skin. They then migrate to the blood vessels in the abdomen where they grow, mate and produce eggs. Water irrigation technology was first invented in the world about 7,500 years ago, in the region of the Middle East between the Euphrates and Tigris river systems known as Mesopotamia. Different techniques are thought to have been used, including facilitating the flooding of fields with river water, and moving water to the fields in man made channels. At Tell Zeidan, the archaeologists believe crop irrigation of some kind was in use as they have found evidence for crops such as wheat and barley that require more water to grow than could be obtained from rainfall alone at the time the settlement was in use. Research into prehistoric rainfall in the region suggests it was just too arid to grow these crops there without extra water. We will never know if the prehistoric individual at Tell Zeidan caught the infection from wading or swimming in a natural water source, or if it was from wading in an agricultural irrigation system. But the presence of schistosomiasis at this early time, in the centuries following the invention of crop irrigation in the region, does show that it could easily have been spread that way, and that early irrigation could have facilitated the spread of the disease across the region. The later Assyrian culture flourished in Mesopotamia from 4,500 years ago, and their medical texts include descriptions of red urine. Since S. haematobium causes blood loss in the urine, this early textual evidence provides further support for the identification of schistosomiasis in the region. People at the time would have seen the benefits of their crop irrigation on the amount of food they could grow, and also the types of plants they could cultivate. However, they would have had no idea that the new technology would lead to huge numbers of people across the world contracting schistosomiasis over the following 6,000 years. Read the article, "Prehistoric Schistosomiasis Parasite Found in the Middle East," in The Lancet.